Our people play a crucial role in TMG's new media ecosystem. We find it important that employees at all levels within the organisation are continuously working on their own sustainable employability. In 2016, we focused on the further development of knowledge and skills that contribute directly to our strategic goals. The average number of FTEs in 2016 was 1,790, compared to 2,023 FTEs in 2015. The average age of TMG employees is 44.5. In 2016, 32% of our employees worked part-time. Of these, 26% were male (with an average part-time percentage of 77%), and 74% were female (with an average part-time percentage of 71%). Part-time employees, or those with a temporary contract, enjoy the same working conditions within TMG as employees with a full-time permanent contract. Excluding the foreign activities of Keesing Media Group. Active freelanders with a contract and a recent active contribution. The far-reaching changes within TMG ask a lot of our people. In 2016, managers were trained to be able to cope with the changing organisation, both for themselves and for their teams. These training sessions strengthened our managers' change leadership and coaching skills. In addition, a coaching pilot was started with a specially selected agency, in order to provide our leaders with the right tools that enable them to better coach and motivate their teams in daily practice. Several training programmes and workshops were initiated during the reporting year in the areas of technology, innovation and entrepreneurship, in line with the new TMG culture. The development programme Mensen Maken Media (M3, People Make Media) that started in 2015 was continued in 2016. The aim of this programme is to develop leadership and management skills in line with the company's strategy. All new managers underwent a development assessment. During four leadership sessions, management received updates on the strategy and ongoing organisational changes. Two of these sessions included an interactive programme to provide inspiration and stimulate company-wide collaboration. The same group also participated in the TMG 24/7 customer event. In addition, in consultation with everyone involved, it was decided to change the Executive Leadership programme of TMG and Nyenrode Business University that started in 2015. The new set-up kicked off in January 2017. In May 2016, the selection process for the TMG Talent Development programme for potential managers and specialists kicked off. In July 2016, the programme started. The programme consists of training modules and coaching; in addition, the participants collaborate on TMG's brand plans, supported by an internal mentor. Learning on the job is the basis of the Talent Development programme. TMG stimulates sustainable employability. In mid 2016, the company-wide training policy was adjusted with this in mind. The rules for repayment of training costs after resigning have been relaxed, the spending budget for training has been raised, and the application procedure has been automated. Because the training budget was raised and the number of employees decreased, the available training budget per employee increased. In 2016, employees did indeed apply for more training programmes than in previous years. In total, we invested € 1.67 million in training and development (2015: € 1.5 million). In addition, 137 trainees gained work experience within TMG. In 2016, to facilitate quicker and more efficient knowledge sharing and to enhance people's skills, we bought e-learning software, so that TMG can create its own training modules for employees. On the basis of the software, a training portal is being set up, which enables employees to find their way in the internal and external training offer. In 2016, HR fully supported the management and team leaders in the preparation, implementation and after-care related to all organisational changes that were initiated and completed. That applied, among other things, to the outsourcing of printing activities, the changes in the structure and portfolios of all business units and TMG corporate departments and the move of Holland Media Combinatie employees from Alkmaar to Amsterdam. In this, HR fulfilled both a strategic and a facilitating role. For the entire organisation, succession planning has been made more transparent. This included a thorough review, in preparation of succession planning for positions becoming available in the near or more distant future within all echelons. In addition, preparations were made for an online succession tool, which employees can use to enter their personal details (e.g., regarding assessments, talents, skills, knowledge, ambitions and performance management results). On the basis of these details, career development opportunities and development needs can be made visible. This contributes significantly to TMG's strategic personnel planning. In 2016, partly on the basis of input from the various reorganisation project groups, the selection process was fine-tuned. The TMG media ecosystem requires new employees with different competencies and skills. Recruitment monitors competency-oriented interviewing, the uniformity of the process and the structural deployment of assessments, which, besides competencies, also take capabilities and agility into account. For TMG's Central Works Council (Dutch acronym: COR), 2016 was a turbulent year, with many far-reaching changes following, among other things, the restructuring of TMG in the publishing companies. Collaboration between the various works councils within TMG was − and is − more important than ever. As a result, the works councils now more often work in committees, such as for the move from Sky Radio Group to the new radio company to be set up together with Talpa. The topics dealt with by the COR are complex. 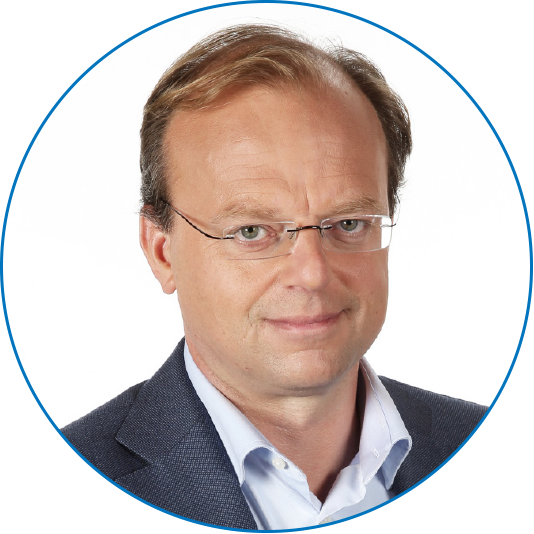 The reorganisation programmes, such as the combination of TMG Landelijke Media and Holland Media Combinatie, are intensive. The committees involved therefore meet on a weekly basis. Interests of the company and those of employees are thoroughly assessed and weighed up. Many employees are affected by the plans, either directly or indirectly. The COR fully understands that something needs to be done to enhance TMG's profitability. Because the issues are getting increasingly complex, the COR regularly calls in the advice of external consultants. The COR always strives to have a representative at information meetings for personnel. It is important for the COR to know what is going on in the workplace. The COR sees itself as a critical partner of the Executive Board, but also thinks along with the Board in terms of content. Besides formal meetings, the daily management of the COR and the Executive Board meet in weekly informal sessions. The insights provided by the COR, obtained among other things through discussions with people on the workfloor, are taken into consideration by the Executive Board in its plans and decision-making. The approval process around the adjustment of the TMG pension scheme, which makes it less generous, was completed in 2016. New and existing employees will be given a choice in the future with regard to their pension. In addition, adjustments were made that brings the scheme more in line with changes in society. Besides all the changes, the new pension scheme results in a cost reduction for the employer. That this change knows no winners was clear to the COR from Day 1. On 14 December 2016, it was announced that Mediahuis/VP Exploitatie is interested in taking over TMG, and later (23 January 2017) Talpa also showed interest in an acquisition. The COR has prepared for this and has examined its role and position in a possible acquisition procedure. The composition of our council has changed: we have a new COR Chair and the seats of Noord-Holland printing plant and Sky Radio Group have been discontinued. In 2016, absenteeism was 4.0%1 (2015: 4.2%). The external support for complex and prolonged cases of absenteeism was continued in 2016. In a number of cases, this extra support accelerated reintegration or led to a stage in which the employees in question were supported in finding a different job. This approach reduces the risk of employees becoming incapacitated for work in the sense of the Dutch WGA Act and shortens the period of absence. In 2016, 2 accidents were reported, which is equal to 2015. The absenteeism policy and protocol are under review; implementation is expected in 2017. The basis of the new policy and protocol will be stronger central management and monitoring of absenteeism. Internal capacity will be made available for this in 2017. In August 2016, agreement was reached on a new Social Plan for TMG to deal with the consequences of the reorganisations. The emphasis in the Social Plan lies on stimulating employees who have been made redundant to find new jobs. The Social Plan applies to reorganisations for which the advice was requested from the relevant employee representative bodies before 1 July 2017, and which advice was given no later than 1 September 2017. In 2016, the transfer of journalists working for door-to-door newspapers to the Collective Labour Agreement (CLA) for the publishing industry as of 1 January 2016 was completed. Together with other large newspaper printing plants, we aim to transfer those employees who currently fall under the CLA for the graphic arts industry to the CLA for the publishing industry. We have therefore terminated TMG's membership of KVGO. A total of 1,265 TMG employees are covered by a CLA. As of January 1, 2016, the personal flex budget ('Persoonlijk keuzebudget') was introduced for employees falling under the CLA for the publishing industry. This makes it possible to apply a number of labour conditions flexibly, of employees' own choice. As of 1 January 2017, a personal flex budget will also be introduced for employees who do not fall under this CLA. In 2016, agreement was reached with the COR concerning the adjustment of TMG's pension scheme as of 1 January 2017. TMG's adjusted pension scheme consists of a hybrid pension scheme and a voluntary Defined Contribution (DC) scheme. In 2016, an extensive communication programme was rolled out to inform employees about the changes. As of 1 January 2017, the proposed pension scheme enables new TMG employees to opt for the DC scheme right from the start. This flexible scheme offers employees the choice as to whether they wish to contribute towards the premium themselves and how much they wish to contribute (up to the fiscal maximum). As of 2018, all employees who were already employed by TMG in 2016 and wil still be employed in 2018 will also be given the choice to opt for the DC scheme. A dispensation request relating to this voluntary DC scheme has been submitted to the Dutch Publishers Association (Nederlands Uitgeversverbond, NUV). In May 2016, the DBA Act, which aims to regulate flexible labour, came into force in the Netherlands. For various business units, TMG drafted model agreements in order to ensure compliance with this new legislation. Onbegrensd Talent advises and supports employers in taking on people who are distanced from the labour market. This may be due to a physical disability or to long-term unemployment, and anything in between. In 2016, security was still high on the agenda. As a media company, TMG is planted firmly in the heart of society, and the nature of our activities forces us to be vigilant at all times. Our focus on security also concerns the security of information and data. In 2016, our Information Security (Dutch acronym: IB) policy was fine-tuned, including stricter checks on the clean-desk rules already in place. More than 50 internal IB ambassadors have been appointed for half a day a week to support a sustainable behaviour and culture change. TMG Recruitment entered into a collaboration with Onbegrensd Talent in order to develop a sustainable policy on creating jobs for people who have become distanced from the labour market. This collaboration is part of our socially responsible HR policy and our goal of having a workforce that reflects society. In 2016, we focused on developing a process that recognises jobs that would be suitable for job-seekers who are distanced from the labour market. Through discussions with managers, team leaders and recruiters, we have created more awareness with regard to this part of our socially responsible recruitment policy. This is now the foundation on which we will build to take the next step in terms of concrete jobs. Also see the Quantitative targets table under Supplementary information. Excuding the foreign activities of Keesing. In the year under review, much attention was paid to the further improvement of our IT infrastructure and rationalisation of the application landscape, with more efficiency, less complexity and better cost control as main objectives. Another focal point was further digitisation of the product portfolio to maximise the contribution to the realisation of the 24/7 strategy . Quality, security, efficiency and facilitating digitalisation are the key words here. In the year under review, all workstations were replaced by Apple workstations. This enables employees to work 24/7, wherever they are. Support for users has been improved by setting up an in-house TMGeniusbar, where users can get answers to all their IT related questions. At the same time, an application rationalisation was implemented, which led to significant reduction in complexity. The move to a new datacenter was the first step towards rationalisation of the infrastructure. In 2016, new architecture principles were delivered. New and existing applications are now built and adjusted in accordance with these standardised principles. This makes them more future-proof and reduces costs, particularly management costs. IT has taken steps to become a 'coordinating' organisation. Current contracts have been reviewed and fine-tuned and our sourcing policy has been adjusted with more focus on using external resources to fulfil TMG's IT service requirements. In the context of the Information Security policy, IT has drawn up a data classification policy for information: what data can be stored where? At the same time, TMG has opted for external secure cloud-based data storage for all employees. In addition, TMG took measures in 2016 to increase TMG employees' cyber resilience. This included an awareness campaign. In addition, in the context of current laws and regulations and responsible business, relevant technological and organisational measures were rolled out in the IT environment in order to further increase information security and keep it at a sufficiently high level. Our IT specialists actively participate in TMG projects and innovation programmes. Besides taking on an advisory role, IT also supports the business wherever possible, even in cases that are not primarily IT's responsibility, for example, in order to solve process disruptions more quickly. IT modernised the digital product portfolio significantly in 2016. For a number of brands, new products were introduced (websites for Telesport, Amsterdam FashionWeek and DFT Kennis; a digital magazine app for Privé). For other brands, outdated digital products were replaced by modern new versions (website of De Gooi- en Eemlander, apps for DFT). A redesign with a focus on video was implemented for De Telegraaf, as well as a paywall for De Telegraaf's website and apps. Due to the introduction of the My Media tool, registered consumers can now use a single TMG account to log into all the digital TMG channels. An online community was created for the brand VROUW and the first digital challenges involving members of that community have been organised. Furthermore, technology was implemented that allows data collection across all brands. This makes it possible to display more relevant advertisements and, thus, increase the advertising value. A special IT board was set up during the reporting year, the members of which include the CIO, the CFO and the Managing Director of TMG Media. The aim of this board is to analyse, discuss and approve important IT issues and plans before they are submitted to the Executive Board for approval. Furthermore, the IT board is responsible for IT planning and prioritisation and monitoring of the progress of projects, thereby making a significant contribution to the overall control of IT. Corporate responsibility is one of the pillars of our strategy. In 2016, our policy in this regard was worked out in more detail. Important non-financial milestones were the further development of our employees (as elaborated on in the chapter Our people), the reduction of our CO2 emissions, our ISO14001 certification, activities in the field of transparency, and the support we gave to social initiatives. During the multi-stakeholder dialogue held in May 2016, extensive discussions were held with external stakeholders about corporate responsibility. Parties such as advertisers, financial institutions, shareholders and NGOs thought along with us about themes like talent development, accessibility of information, privacy and responsible sourcing. More on this can be found in the annex TMG Stakeholders. Besides the development of people, these stakeholders mainly see the improvement of environmental performance, transparency and social engagement as corporate responsibility items that are relevant to TMG. The most important raw materials that TMG uses are paper and energy. That is why, in improving our environmental performance, we focus on energy reduction, CO2 reduction and the use of paper that is certified as sustainable. Since 2012, TMG participated in the long-term agreement (LTA3) on energy efficiency which the graphics sector had entered into with the Dutch government for the period 2012-2016. This LTA3 terminated at the end of 2016. In consultation with the relevant authority and the implementing government agency for entrepreneurs in the Netherlands (RVO), TMG has decided to also join the LTA3 MJA3 2017-2020. In the light of this, we renewed our Energy Efficiency Plan (EEP) in 2016. This plan describes new, cost-effective energy-saving measures that will be implemented in the coming years in order to achieve a cumulative reduction in energy consumption of 8% in the period 2017-2020. In addition, agreements regarding energy monitoring methods and execution have been laid down. Thanks to the EEP measures we took in the period 2013-2016 (e.g., the installation of LED lamps, movement sensors, the roll-out of new, more economical IT equipment, more efficient usage of the floor space in building and of cooling machines), compared to the 2012 baseline measurement, energy consumption in Amsterdam declined by 9.2% (the actual total consumption declined by 31.1%). Because the printing plant in Alkmaar was closed and, at the end of the year, Holland Media Combinatie moved to Amsterdam, not all EEP measures planned were carried out in Alkmaar. Nevertheless, compared to the 2012 baseline measurement, Alkmaar consumed 7.8% less energy. The actual total consumption in Alkmaar declined by 63.8% compared to 2012. 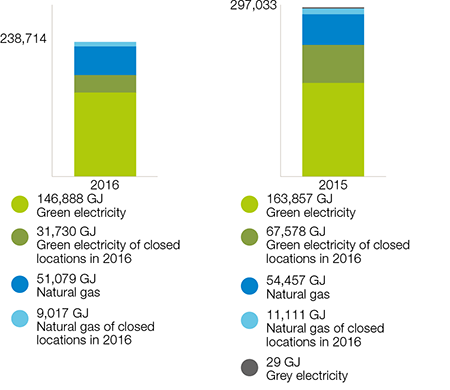 TMG's total energy consumption (gas and electricity) declined by 19.6% compared to 20151. More information about energy consumption can be found in the annex Quantitative targets table. TMG aims to make its impact on the environment transparent. 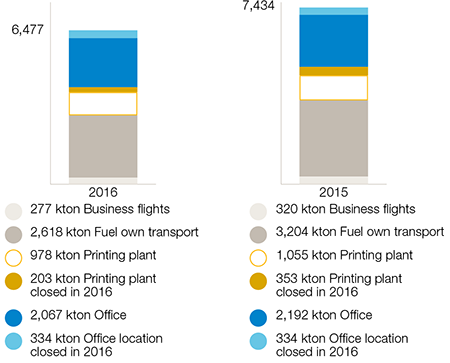 To this end, we measure and publish the CO2 emissions of office buildings, the printing plant and in-house-managed transportation (Scopes 1 and 2 as defined in the international Greenhouse Gas Protocol guideline), as well as the CO2 emissions from business flights. We aim for a reduction of 20% of the absolute CO2 emissions at the end of 2018 compared to 2014. In 2016, our CO2 emissions fell by 26% compared to 2014. This decline was mainly due to the closure of the printing plant in Alkmaar, the closure of part of the printing plant in Amsterdam, and the closure of some other premises in the country. The combination of these locations at Basisweg has not led to an increase in energy consumption or CO2 emissions at Basisweg. Our LPG forklift trucks have been replaced by electric models, which contributed to reductions.The fact that our leased-car fleet shrank by 73 cars also led to a decrease in our CO2 emissions. In addition, TMG limits the environmental impact of its lease cars by making it obligatory for employees to choose a car with an A, B or C environmental label, and setting a CO2 upper limit per label. To further limit the impact of TMG's energy consumption, we have been using renewable electricity since 2011. We do this in the form of Guarantees of Origin (GOs) as issued by CertiQ, originating from wind energy generated by a windmill park in Sweden. In 2016, 100% of the electricity we used was certified as sustainable. All our offices in the Netherlands and abroad make use of CO2-neutral electricity, as a result of which our CO2 emissions in scope are nil. We aim for our annual electricity consumption to be 100% certified as sustainable. Besides our direct CO2 emissions, we aim to make TMG's climate impact in the chain more transparent (Scope 3 as defined in the international Greenhouse Gas Protocol guideline). In 2016, we started a programme to gain more insight into the energy efficiency (low Power Usage Effectiveness values, PUE) and CO2 performance of our external data centres that host our online products. In 2017, we will take criteria related to this into account in the tender process, in order to enable the hosting of our online products in energy-efficient external data centres. In addition, in 2016, we entered into negotiations with our paper suppliers about the possibilities of making the climate impact of our print titles in the chain transparent. This will be worked out further in 2017. At year-end 2016, 100% of the external hosting of our online products made use of sustainable electricity. This concerns qualified data centres contracted by TMG as product/service for the housing of physical server infrastructure. Data centres that are used by suppliers as non-specified part of contracted managed LaaS, PaaS and SaaS cloud services are not included in this scope. For these data centres it can generally be specified regionally, but not specifically, from which data centre(s) and using which specific servers a cloud service is delivered. Within the above-mentioned scope, TMG aims to gain more insight into the energy efficiency (low PUE values) and CO2 performance of our external data centres that host our online products. Paper is another important raw material. To produce paper, wood pulp is used. The origin of the wood pulp we use is an important environmental factor in the light of responsible forestry. In 2016, 100% of all the newsprint we procured consisted of paper that was certified as sustainable. This means we have achieved our ambition to ensure that at least 95% of the newsprint we procure annually is certified (PEFC, FSC or equivalent). The use of wood (virgin fibre) remains indispensable in paper production, because paper can eventually be recycled six or seven times, after which it can no longer be used for printing newspapers. We deal with this in a responsible and conscious manner, so that it does not necessarily have a negative effect on the environment (see also below: 'Virgin fibre indispensable in paper recycling'). In 2016, we used 40% recycled paper in our production, thereby achieving our target of 40%. For 2017, we stick to our target of at least 40%. Following the QI technology pilot in 2015, this technology was implemented on all of TMG's printing presses. This has resulted in significant environmental advantages, as less paper is wasted when the presses are started up. Moreover, the technology reduces the use of water and ink. The total volume of residual materials declined by 46% from 5,299 kilotons in 2015 to 2,883 kilotons in 2016, of which 95% was recycled. This decline was mainly due to the closure of the printing plant in Alkmaar. 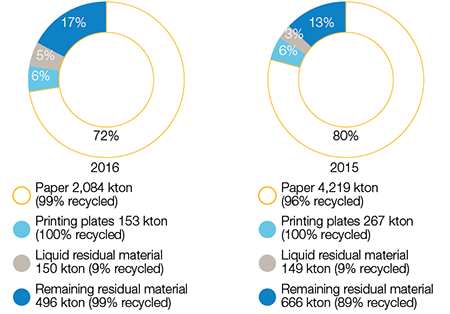 At 72%, paper continued to be the largest residual flow, of which 99% was recycled. This mainly concerns paper used in the set-up of the printing presses. The printing plates are manufactured in such a way that the aluminium of the used printing plates can be fully reused by suppliers. The figure below gives an overview of the groups of residual materials within TMG and the percentages that are recycled. We aim to recycle 90% of our residual materials on an annual basis. By 2018, we aim to recycle 100% of our paper waste. ● complies with all legal obligations. We believe in transparent business. By being open about our actions, we aim to remain a reliable partner for consumers, advertisers, suppliers and other business partners. Important topics that contribute to our transparency include securing corporate responsibility, tax compliance, responsible content creation, privacy, information and data security, and responsible procurement. TMG participates in various benchmarks to provide stakeholders with the necessary insights and to further improve our performance in this area. As a strategic pillar, corporate responsibility is an integrated part of our business operations. It should contribute to a firm and responsible basis for TMG, now and in the future, with a maximally positive impact on people, the environment and society. Our approach, which is based on our corporate responsibility policy, contributes to our reliability and our credibility as a leading media company, our innovation power and our anchoring in society. As part of our corporate responsibility policy, we endorse the principles of the UN Global Compact, the OECD Guidelines and the Fundamental Principles and Rights at Work as formulated by the International Labour Organization (ILO). The responsibility for the corporate responsibility policy lies with the Executive Board of TMG. The CEO has the overall responsibility for the performance with regard to the commitment laid down in the policy document 'TMG actively engaged, every day'. This can be found on our website. providing support, pointing out potential issues and suggesting adjustments in the operational execution of the corporate responsibility strategy. At the end of 2015, a Corporate Responsibility Steering Group was formed. This group consists of the CEO (Chair), the Head of Corporate Development, the Corporate Responsibility Manager and a professor in the field of sustainable business. This Steering Group meets twice a year. In addition, an Actively Engaged Steering Group was set up. This group consists of employees from various departments and brands: a cross-section of our entire organisation. They bring in ideas and initiatives to engage and energise employees. UPM is one of TMG's most important paper suppliers. Besides producing recycled paper, this international sustainable company is also involved in energy and biorefinery. 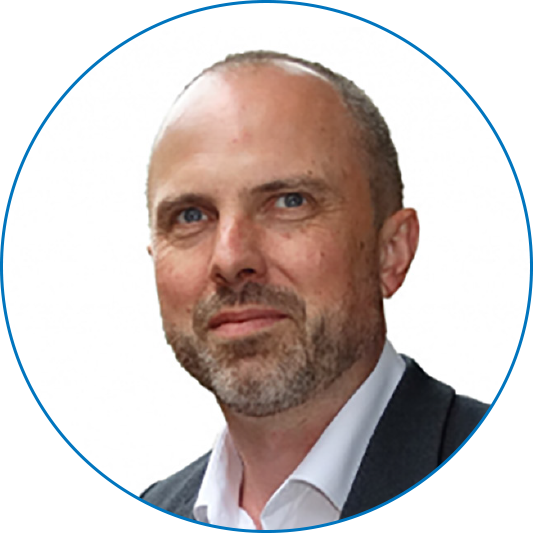 John Sanderson, Head of Environment in the UK and Ireland and one of the environmental specialists within UPM, responds to TMG's strategic choice not to use 100% recycled paper all the time. ‘You only need a little technical knowledge of paper to understand that companies that use 100% recycled paper are not necessarily doing what is best for the environment. Technically, recycling of paper is actually down-cycling. Because what's often forgotten is that the wood fibres in the paper get weaker during each cycle of deinking and reuse. The fibres lose a little bit of their quality every time, which is why the quality of the paper decreases. On average, a wood fibre can be recycled some six times before it gets too weak or too short for further use in paper. On a global scale: without the introduction of virgin fibre to replace these "spent" fibres, all fibres in the worldwide paper cycle would be used up in about six months. So, the reuse of paper can only be sustainable in the long term thanks to the use of virgin fibre. A sustainable paper cycle needs both types of fibre. The accountability with regard to our organisation’s management and financial performance in 2016 is discussed in the sections Performance and Corporate Governance. TMG considers it important that it correctly applies the relevant tax laws and international standards (e.g., the OECD guidelines). TMG strives to fully comply with these laws and international standards as to their object and purpose. In general, taxes follow from operational activities at TMG, and results are taxed where value is created. Group Tax Affairs is responsible for TMG's tax policy TMG and secures compliance with tax laws and regulations. The Tax policy is an integral part of TMG’s Risk Management policy and also forms part of the In Control Statement. Group Tax Affairs actively informs TMG's departments (e.g., Commerce and Finance) about changes in tax laws and regulations, and regularly consults the departments about the tax issues involved in this. In addition, there is a policy for special transactions or occurrences that mandate consultation with Group Tax Affairs. TMG is committed to an open dialogue with the Dutch tax authorities, based on mutual respect and trust. In parts, convenants have been agreed to with the Dutch tax authorities, in which binding agreements have been made about TMG's methods, internal auditing and tax position. TMG has made these agreements to obtain confirmation of its views on tax-related issues based on complete openness and transparency regarding the facts and circumstances. TMG's Tax Control Framework has also been shared and discussed with the tax authorities. In addition, TMG entered into a dialogue with a few fiscal experts from an NGO. Considering TMG's moderate tax-related activities, TMG was supported in the way in which tax matters are organised within the organisation. TMG is committed to the careful and confidential management of privacy-sensitive information, such as databases and other information relating to its customers (including subscribers) and employees. For this purpose, we developed a Personal Information Code of Conduct in 2015. Employees must act in accordance with the applicable privacy laws and this Code of Conduct. The aim is to treat personal information with care and within the legal frameworks in order to make optimal use of this information, while preventing any damage or infringement of privacy. The Privacy Statement for customers includes the purposes for which TMG processes the personal information of its customers, the instances in which they may provide this information to third parties, and the way in which customers may gain access to their personal information and object to the processing of their details. A link to TMG’s Privacy Statement is placed on most of TMG's websites. For a number of websites, an adjusted privacy statement is applicable because it better suits the nature of the services. The adjusted privacy statement can be found on the relevant site. Of course, we also pay attention to the security of our systems and customer information (for more information, see the section on IT. Group Procurement has segmented suppliers on the basis of risks. Procurement weighs corporate responsibility on the basis of the risks involved, combined with the corporate responsibility topics that are material to TMG. This is also shown in the annex TMG Stakeholders. Once suppliers have been classified by Procurement as low risk and high availability, they have to agree to our Supplier Code of Conduct before they are given an assignment. In 2016, the KPIs for responsible procurement were updated, and the target percentage of codes of conduct signed by suppliers was changed. Up to 2016, the number of centrally contracted suppliers was taken as point of departure. In 2016, Procurement started working with a new system for its contracts. This included a system clean-up. The current system reveals that, in 2015, 73.0% of the centrally contracted suppliers had signed our Code of Conduct. In 2016, this was 73.4%. As of 2017, we take total spend with suppliers as our point of departure for the target percentage. It is our ambition that in 2020 80% of our spend will be qualified by our Code of Conduct or an equivalent thereof. In 2016, this was 42%; in 2017, our target is 50%. Also see the Qualitative targets table under Supplementary information. In addition, we have set as a target that, in 2020, corporate responsibility will be taken into account in 100% of the tender procedures as part of the award process. This target was included in the set-up of a new purchase-to-pay system, which went live in 2016. Our target for 2017 is 60%. TMG wants to offer consumers unconditional, independent information and entertainment in various forms; information should be available and accessible anywhere, anytime. We strive to not be influenced under any circumstances by charitable or political interests, groups or lobbies. The integrity, independence and neutrality of TMG’s products and services should always be ensured. The editorial staff’s own responsibility and independence have been laid down in editorial statutes. These mainly serve to guarantee the journalistic independence of the editorial staff within a commercial organisation. To TMG it is obvious that all statutes must have freedom of expression as their basic value. For our national and regional dailies and magazines, customers who have a complaint can contact our customer service through various channels. All complaints are registered. Customer satisfaction surveys following the contact with the customer are one of the ways in which the quality of complaint settlement is monitored, and adjustments are made where necessary. More and more companies in the Netherlands are working on responsible procurement. Social Enterprise NL links social enterprises to companies looking for socially responsible suppliers. The collaboration between TMG and Closing the Loop for the recycling of used mobile phones is seen as an inspiring example. In order to assess TMG’s performance, it is important for us to participate in leading initiatives in the field of sustainability, such as the Global Reporting Initiative (see our GRI table), and benchmarks such as the Transparency Benchmark and the Carbon Disclosure Project (CDP). The Transparency Benchmark, set up by the Dutch Ministry of Economic Affairs, assesses companies on their level of transparency in their reporting, including their CSR reporting. In 2016, TMG scored 160 points, 7 more than in 2015. In 2018, we would like to score more than 170 points; the maximum score is 200 points. Also see the Qualitative targets table under Supplementary information. The Tax Transparency Benchmark, set up by Vereniging van Beleggers voor Duurzame Ontwikkeling (VBDO, Association of Investors for Sustainable Development) and PwC, assesses to what extent organisations provide clear insight into their tax policy and taxes paid. In the overall ranking of the Tax Transparency Benchmark 2016, TMG was No. 10. In 2015, we were No. 51, which means we made significant progress. The Carbon Disclosure Project (CDP) is an independent non-profit organisation that strives for a global reduction of CO2 emissions (emissions of gases, including CO2) and a sustainable use of water by companies as well as cities. In 2016, TMG maintained its C status. TMG's reports can be viewed on www.cdp.net under 'Data and Insights'. TMG operates in the heart of society and, from a journalistic point of view, has been socially engaged for many years. By means of social initiatives and engagement, we strengthen and broaden the connection that TMG already has with society through its core activities. In the sections on the business units, a selection of the many initiatives undertaken in 2016 are highlighted. An important theme in this regard is providing access to our content for groups for whom this is not self-evident, such as those with visual or hearing impairments, people who do not speak Dutch, and people living in poverty. In 2016, we started a pilot to make our content more easily accessible to people with low literacy. We aim to explore a new initiative within this theme every year. In 2016, TMG supported an Oranje Fonds talent school project that helps children from a disadvantaged background improve their language skills and participate in society more successfully. The amount donated was raised by selling old company telephones, which, in collaboration with social enterprise Closing The Loop, were disposed of in a responsible way in 2016 (see also the box 'Responsible procurement increasingly based in intrinsic motivation'). Phones that were in a good state were sold, and defective phones were repaired or refurbished in a sheltered workshop, in order to give them a second life. TMG selected the talent school project due to the close match with TMG's core activities. Our brands are committed to making content accessible 24/7 to as many people as possible, including those for whom this is not self-evident. The support given to this project contributes to this. Consumption December is an estimate. De Telegraaf is one of the most important news brands and opinion makers in the Netherlands. We have impact: what we reveal, what we put on the agenda and what we believe. This is not only thanks to our reach, but also because De Telegraaf always stays close to the reader. We're a popular newspaper, of the people. Content at De Telegraaf finds its way to the news consumer through various platforms: via print and online, and soon also through the 24/7 online news channel Telegraaf VNDG. In terms of reach, De Telegraaf's website is one of the most visited in the Netherlands and with regard to the development ofonline video we're in the lead. Nevertheless, the power of news brand De Telegraaf still mainly derives from its printed daily. Our headlines on the front page are often the talk of the town. Everyone wants to know what the country's most popular newspaper is saying. That's why the print edition needs to be cherished. It serves as a springboard and is crucial for our impact as a news brand. The challenge will be to build on this leading position further in words and images. If De Telegraaf wants to stay as big as it is now, we will need to hang on to the power we now have as a news brand and innovate from there. In my view, we will need to take along our loyal readers in this rapidly changing world while also tapping into new target groups as a cross-media company. If we do that sensibly, beautiful years lie ahead for our media company. Our team of investigative journalists come up with sensational stories. Joris Polman and Eva Gabeler painted a revealing picture of the German quack Klaus Ross, who is suspected of sending several cancer patients to their death. Thanks to Mick van Wely and Joris Polman, there will be an investigation into money wasting by the Central Works Council of the police force – who managed to spend more than two million euros in just a couple of years. Mick van Wely and John van den Heuvel also exposed how corrupt customs officers let containers full of cocaine enter the Port of Rotterdam. It led to a major inquiry into crime and corruption. These three stories were submitted to De Tegel, the most important journalism award in the Netherlands. Max Verstappen’s Formula 1 season was spectacular. With an in-season promotion from Toro Rosso to Red Bull Racing, a historic victory in Spain, a serious crash, a number of controversial overtakes and a memorable race in a downpour, the Limburg racing talent unleashed a hype. Telesport editor-in-chief Jaap de Groot, along with colleague Frank Woestenburg, reported on this historic racing season for all Telegraaf platforms and for months were witness to Max Mania from close up. Ever since the credit crisis in 2008, when stock prices plummeted, it’s been raining pessimistic stories about pension funds. Just when it looks like it can’t get any worse, it does. It is especially the historically low and still declining interest rates that are affecting the financial position of pension funds. The less they earn on savings, the more the pension funds are being obliged by the regulator to set aside for future distributions. De Telegraaf has been devoting considerable attention to the pension crisis through a series of stories about how this is affecting people, and what can be done about it. In 2016, John van den Heuvel continued his mission to track down and unmask ‘cuddly criminal’ Willem Holleeder. The crime reporter revealed that, in an exercise yard at the maximum-security prison in Vught, the country’s most notorious criminal managed to give orders to two fellow prisoners to kill his own sisters. Shortly afterwards, sister Astrid Holleeder told De Telegraaf about her life in the shadow of her dangerous brother, from abuse within the family to secret eavesdropping missions, when Willem Holleeder confessed to several murders. Unfortunately, 2016 was also the year of terrorist attacks in Europe. In March, 31 people were killed in attacks in and around Brussels. In Nice, a few months later, an 18-year-old IS supporter drove a big truck into crowds on the famous Promenade des Anglais, leaving 86 people dead. In Munich, an 18-year-old German-Iranian caused a massacre, shooting nine people dead. These were major news events, and people wanted to know all about them as soon as possible. The power of regional news within TMG is that we go where others don't, every day. In our local area, we're always more quickly at the scene than anyone else. This has both advantages and disadvantages: because we're so close to the action, we can see the detail, but we may overlook the big picture. It is my ambition for the coming years to achieve both: tell the local story and share the big picture. Regional journalists are the 'feelers' in people in the region, inform and entertain them, and give them a voice. Their tangible presence in the region results in charming stories that supplement the national news. Making good regional news doesn't happen by itself. It takes years of investment in the regional network to get to a unique local or regional story. The physical newspaper remains important, as it is a friend of the family for our readers. Readers are 'members' of our newspapers, not 'subscribers'. Their relationship with their local daily often goes back decades. In early 2017, we received more than two thousand postcards, showing, often in a moving way, how much readers are attached to 'their' newspaper. Unfortunately, it is exposed to the same economic forces as other products, and it will therefore need to make smart use of the resources available − for example, by making use of all other TMG platforms and exchanging content in order to engage new audiences − but without compromising our own perspective. The Wadden Sea seems ill-prepared for an oil spill. As the area cannot be closed off, any cleaning work would need to be done in just one tide. Oil recovery ships can hardly be used, because the sea is too shallow. Reporter Rien Floris reports on the chilling tale sketched by international oil-spill expert Wierd Koops. The Wadden Sea had just been voted the most beautiful nature reserve in the Netherlands. Only two weeks later, the bad news was announced at a symposium on dealing with oil spills. The story was published in all of TMG's regional dailies and was taken up by Omroep Fryslân, among others. Until a few years ago, GPs were usually men. No longer. Reporter Rien Floris saw it coming – the tipping point when women GPs would outnumber male GPs. Anticipating the future, he asked NIVEL, the Dutch Institute for Health Services Research, to follow the case and chart developments. This story was regionally enriched by interviews with male and female GPs. Additionally, we commissioned our own opinion poll, held by Regiopeil.nl. A total of 2,264 people took part in the poll, enough to make the results highly reliable. And there’s more news: 15% of people changed their GP on the grounds that they prefer a female or a male GP. The story appeared in all regional editions and was partly taken up by the Reformatorisch Dagblad. In the summer of 2016, a well-known song by Ramses Shaffy (‘Sing, fight, cry, pray, laugh, work and admire’) was chosen as the theme for Summertime, the regional newspapers’ weekend supplement. Every week, suitable content was produced to link up with one of these words – which was given a summery feel, of course. In the Netherlands, a social security benefit is the last financial safety net provided by the government. To receive this benefit, people need to comply with the new Participation Act, which regulates employment and job-application obligations. In the course of 2016, reporter Bart Vuijk of Noordhollands Dagblad (Kennemerland edition) began to hear rumours of whistle-blowers complaining about malpractices in welfare support. After extensive research (twice submitting requests under the terms of the Open Government Act), it turned out that, because of the Participation Act, almost 700 people on benefits were having their benefits reduced, by in total €140,000, even though this legislation was supposed to encourage people to find work, not to punish them more. The topic is now on the political agenda in the municipalities around IJmond, and questions are being asked in Parliament about working conditions in the organisation responsible for implementing the Participation Act. The story appeared in all of TMG's regional dailies. In a historical, cultural and financial investigation that was unique in its depth for regional newspapers, Leidsch Dagblad outlined the interplay of politics, the hospitality industry and the real-estate sector in seaside town Noordwijk. The six-part series painted a shocking picture of the functioning of local democracy, such as a real-estate consultant who was using his former position as alderman to gain advantages in real-estate deals. The final part of the series contained a number of constructive proposals for improving integrity in municipal real-estate policy. Leidsch Dagblad published six abbreviated versions of the articles, the full versions of which were posted simultaneously on www.leidschdagblad.nl. Together, they formed the ‘Building Site Noordwijk’ file. The series was submitted as nomination for De Tegel in the category of Investigative Journalism. In the first week of September, Dagblad Zaanstreek published a story about Poelenburg, a district in Zaandam. A young vlogger, Ismail Ilgün, had put videos online showing local youths loitering in the neighbourhood supermarket and harassing residents and the police. The newspaper was tipped off by a residents’ committee, who were shocked about what was going on, and urged the local authority to finally to do something about the problems. The word ‘Treitervlogger’ (bully vlogger) was named Word of the Year by the main Dutch dictionary, Van Dale. Ismail Ilgün signed a management contract with Top Notch. The live blog attracted around 20,000 visitors during the week of publication. Several articles on Noordhollandsdagblad.nl were read 10,000 times.